LUCKNOW, INDIA--(Marketwired - Oct 6, 2015) - Renaissance Hotels, a hotel brand known around the world for helping the next generation of business travelers to discover unexpected cultural experiences, announced today the opening of its first hotel in North India, in the city of Lucknow. With 16 floors and 112 stylish rooms, it is the tallest hotel to open in Lucknow and offers stunning views of the Gomti River and the city's landscape. 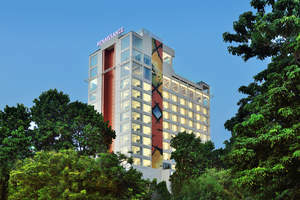 Renaissance Lucknow Hotel is the brand's second hotel in India after almost 14 years, with the first Renaissance hotel being based out of Mumbai city. Marking the occasion said Mr. Rajeev Menon, Chief Operating Offer - Asia Pacific (excluding Greater China), Marriott International. "Lucknow is fast emerging as a cultural and business hub in Uttar Pradesh and makes for the perfect location for a Renaissance Hotel. Renaissance Hotels is a global, lifestyle hospitality brand that seeks to inspire and provoke its guests to discover something new and different each and every time they visit." The Renaissance Lucknow Hotel features a contemporary design that is juxtaposed against the heritage background of Lucknow. The centrally located hotel provides easy access to business hubs as well as popular leisure destinations in the city. Designed with refined sophistication and exuberant fun, the Renaissance Lucknow Hotel has 96 tastefully appointed rooms and 16 suites that offer modern luxury and unparalleled convenience to its guests. All guest rooms feature cotton rich linen, 42-inch LED HD televisions, spacious work and seating areas along-with a modern three-point bathroom. The hotel in Lucknow features a variety of dining options that include L - 14, the international cuisine all day dining restaurant; Sepia - the Awadhi speciality fine dining restaurant; Coffee & Cakes - the hotel patisserie that specializes in freshly baked pastries, sandwiches, cakes and brewed coffee; and the Sky Bar - the poolside bar located on the 16th floor offering exquisite wines, cheese boards and an exclusive range of International beverages. Leisure facilities at the hotel also include a well-equipped fitness centre, a yoga studio and a rooftop infinity pool and Jacuzzi. Conveniently located in the city's centre, the business hotel in Lucknow offers extensive facilities for social events and meetings. Spread over 26,000 sq ft, the versatile indoor and outdoor space features the Renaissance Hotels signature R.E.N. meetings program, designed to bring live entertainment and the best of the local destination to your business or social gathering. The lush Ren Garden at the hotel offers the opportunity to enjoy the beautiful outdoors during social events. Dedicated event & wedding specialists, specialized services, customized menus and modern fittings ensure attention to the last detail. The hotel will also feature The Renaissance Hotels exclusive "NAVIGATOR" concierge program and its recognized entertainment program, known for bringing the very best of music, arts, culinary and more into each of the brand's 160 hotels around the world. "The Renaissance Lucknow Hotel brings a modern, new face of hospitality to Lucknow and is sure to set benchmarks in the city," said Mr. Rahul Maini, General Manager, Renaissance Lucknow Hotel. "With our vibrant new F&B options, extensive leisure facilities and insights into the city, we are confident that the hotel will be a favourite for travellers and Lucknow residents alike". Renaissance Lucknow Hotel with 16 floors and 112 stylish rooms features a contemporary design that is juxtaposed against the heritage background of Lucknow. Designed with refined sophistication and exuberant fun, the Renaissance Lucknow Hotel has 96 tastefully appointed rooms and 16 suites that offer modern luxury and unparalleled convenience to its guests. The hotel features a variety of dining options that include L - 14, the international cuisine all day dining restaurant; Sepia - the Awadhi speciality fine dining restaurant; Coffee & Cakes - the hotel patisserie that specializes in freshly baked pastries, sandwiches, cakes and brewed coffee; and the Sky Bar - the poolside bar located on the 16th floor offering exquisite wines, cheese boards and an exclusive range of International beverages. Leisure facilities at the hotel also include a well-equipped fitness centre, a yoga studio and a rooftop infinity pool and Jacuzzi.